Winter in Dallas this year has been a fickle friend indeed. I can count on my hand the number of times I’ve actually needed a big, heavy overcoat this season. It just hasn’t been terribly cold! I can’t say I don’t love it. While I love to pull out layers and bundle up in the winter, I find lugging around coats to be incredibly annoying. This year, it’s been more about layering with items that aren’t bulky that I can wear all day and night, like a cute cape or blanket cardi. I just picked up this one by a new-to-me brand called Glamorous and shockingly, it’s under $100! I was a little hesitant to order it simply because I was worried about quality, but this blanket cardigan gorgeous. It’s the ideal day-to-night topper for these unpredictable Dallas weather days. Just with a change into pumps and a clutch, it’s a chic outfit for a night out! I also want to mention the turtleneck I’m wearing here. I’m sure you all have seen or heard of Norma Kamali – she’s probably best known for her retro chic swimwear designs (think high-waisted briefs and Marilyn Monroe-esque tops), but she also designs classic, cool womenswear pieces like this sleek black jumpsuit, this basic boyfriend blazer and this shaggy vest. I’d been on the lookout for a few more simple black sweaters, and this one popped on my radar. I’ve never owned any pieces by her so I wasn’t sure what to expect – let’s just say I was very pleasantly surprised! It’s made of the softest jersey, so it’s easily the most comfortable sweater in my closet right now. It’s also a great length (read: not too short). Did I mention this miracle sweater is under $80? Cha-ching. PS – if you tried to access the blog this weekend and were having trouble, I apologize! I had to change servers over the weekend (so the site will run faster!) and there were a couple hiccups moving it over. You may still have some issues with connecting to thestylescribe.com today, but all should be back up and running like normal by tomorrow! Sorry for the inconvenience!! Adorable cardi. I like the colors. Headed over to check out Glamorous now. I love all the colors of the cardi! I also love your shoot location, the background is perfect! This blanket cardi is gorgeous. I understand what you mean about the concern over quality when something is so reasonably priced, but this one looks like a gem. I absolutely love that dark brick background with this looks. Such stunning photos, Merritt! Love that wrap, it looks so cozy! YAS! I love this on you! Beauty! I love these types of cardis – relaxed and versatile. Love love love those cute slip ons – so sad that they are sold out! Anyways, hope your week is off to a great start girl! I love this darker, moodier look on you. That cardi looks like a warm blanket I’d never want to get out of! The cardigan perfect for cooler days here in Miami! Love the colors of the cardi. Also the background really compliments the outfit nicely. This cape looks so cozy, love this look. love that blanket cardigan!!! so gorgeous!! Love it! That blanket card so perfect, and it looks great with the distressed denim. Omg the blanket cardi is EVERYTHING. Love with those shoes, the whole vibe is great! This is such a great look! 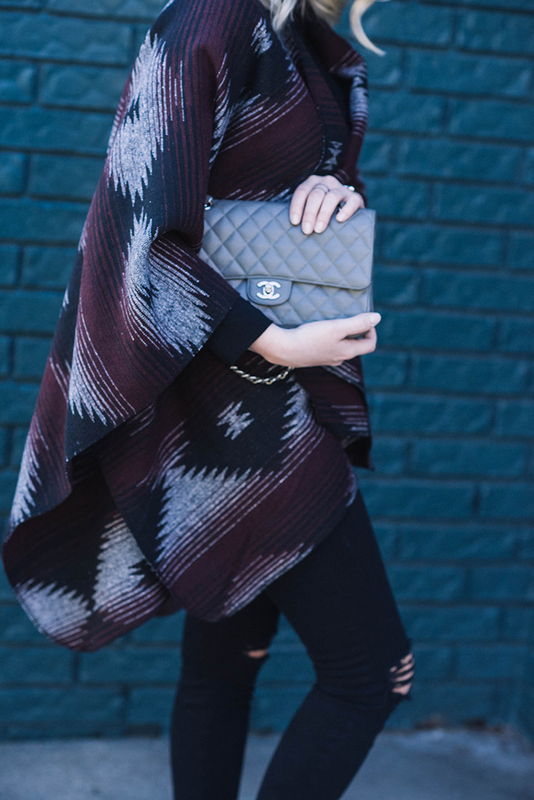 Love the tribal inspired cape with the hat and distressed denim. Another fab look. I have an awesome cash giveaway up on W&R – hope you’ll check it out! This blanket is so beautiful! LOVE this super cozy looking cardigan!! Great weekend look!! This is a really cute casual look on you. Love the blanket wrap. Great choice – that blanket cardigan is so stylish!!! So so cozy! Absolutely love it!